Our friends at Dream Yacht Charter asked us to write a report for bareboat charterers booked to sail in the BVI this season. Here’s one crew’s perspective after cruising during the last week of October 2017. It’s no secret that the Virgin Islands have been hit hard by Hurricanes Irma and Maria. It will be impossible to visit this season without being reminded of the storms. But that doesn’t mean that your long-planned vacation has to become a tour of devastation. The geography of the British Virgin Islands means these are still spectacular cruising grounds. The physical damage in the islands is worst in areas of heavy development, whereas the natural wonders are mostly unaffected. Roadways on Tortola are in poor shape and you should allow extra time for taxi transfers. In Road Town, provisioning is unaffected; the local grocery stores and liquor stores are very well stocked. 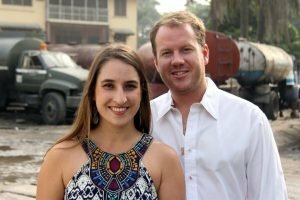 This includes fresh produce, imports and specialty items. Norman Island has long been a favorite stop for a night or two on charter, and this should not change. Neither The Club or Pirate’s Bight restaurants are currently open in The Bight, but construction crews are working on the restaurants during daytime hours. Another team is working to move the wrecked Willy T off the shore; it’s so deeply buried in the beach that it’s almost more of a marvel than an eyesore. The Caves and the Indians are both still great snorkel spots. Mooring balls are available in The Bight, Kelly’s Cove, Privateer Bay and Soldier Bay. For those comfortable anchoring in deeper water or anchoring and tying a long line to shore, Benures Bay remains a peaceful spot. Whelk Bay, White Bay and Key Bay are still nice, quiet anchorages in which to take cover from a northerly swell. National Park Moorings are still in place at the RMS Rhone. The wreck of the Rhone is untouched. This is a great year to earn your scuba certification and put it to use. Because of the amount of debris ashore we have struck this from our list of easy hikes for the time being. Cooper Island Beach Club does not plan to reopen until April, as of now the property and the beach at Machioneel Bay is a construction site. Mooring balls are still available; we would favor the Cistern Point side for snorkeling. You can also anchor and enjoy the natural beauty at Hallovers Bay. Bareboaters can reprovision at RiteWay East End—and use their convenient dinghy dock. Many wrecks ashore make this a practical but unattractive anchorage. Support the local dive operators by arranging a dive at Ginger Island. Underwater life throughout the BVI are in good shape, with dive sites faring better than shallow snorkeling sites. National Park moorings are for 90-minutes of day use only; but Fallen Jerusalem is worth a stop to snorkel. It’s an underwater version of the Baths, and the sea life here is spectacular. Hurricane Irma washed Trellis Bay’s long-term liveaboards and abandoned boats ashore in Trellis Bay. While this renders the beach unusable, Trellis Bay is still a practical spot for airport pick-ups and drop-offs. Trellis Bay Market is serving both lunch and dinner and their convenience store will reopen in next few weeks. Marina Cay is currently closed; no fuel, water or ice is available on the dock. The mooring field is untouched, but until the island is cleared and cleaned there are more attractive anchorages available. Scrub Island’s marina appears in relatively good shape but they are currently closed for assessment and repairs to the resort. The Baths remain a 5-star attraction, as beautiful now as ever. Top of the Baths restaurant and bar is open and would make a great lunch stop. We have not personally visited Virgin Gorda Yacht Harbor but we understand that no resources (dock space, power and water) are currently available for cruisers. Anchorages up the leeward side of Virgin Gorda are still pleasant. These include Savannah Bay, Long Bay and Mountain Point. Leverick Bay Resort & Marina has made a big effort to reopen the bar, restaurant, Chef’s Pantry supermarket and the spa. Leverick Bay is the only attraction currently open in North Sound. No word yet on Michael Bean’s legendary “Happy Arrr” show. The Sandbox, Bitter End Yacht Club, Saba Rock, Yacht Club Costa Smeralda and the Fat Virgin Café are all currently closed. Unless you have an appetite for viewing hurricane damage, we recommend sailing around Prickly Pear island to the North to visit Eustatia Sound. At this date, Eustatia Sound is a good alternative to North Sound. It has several stunningly beautiful anchorages. Cruisers should transit this area slowly, in good light and with a lookout posted on the bow. Anegada was spared the worst of Hurricane Irma and is quickly repairing the damage. The channel markers are not on their pre-storm station but do mark a safe channel into the mooring field. We’re giving Anegada two thumbs up and recommending that visitors spend two nights here to allow a full day exploring ashore. Almost every bar and restaurant plans to reopen for the Anegada Lobster Festival in late November. Damage to the structures on Guana Island is visible from White Bay, where overnight moorings are available. National Park moorings are still in place at Monkey Point and snorkeling there is top-notch. There is lots of clearing up left to do in Cane Garden Bay. Myett’s is scheduled to reopen by December, until they do we are not aware of any services open for cruisers. Sandy Spit is both a beautiful stop, though it’s too exposed for an overnight anchorage. The mooring balls at Diamond Cay are still present, though building debris from the site of Foxy’s Taboo and B-Line Bar can be seen over the land. Your friend Foxy is ready for your visit, and other establishments on Jost Van Dyke are working hard to do so. 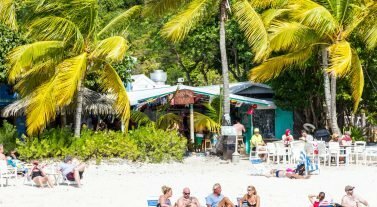 Current residents of the BVI are gathering in White Bay each Sunday for a flotilla and beach party—the home of the Painkiller lives on. Soper’s Hole suffered significant damage to homes and marinas. Mooring balls are present and BVI Customs and Immigration services are available. Omar’s Cafe and Pusser’s Landing are both open; between the two restaurants you can get breakfast, lunch and dinner daily. It’s only been six weeks since the storms and the islanders have accomplished so much so far. Locations reported here will continue to change and improve. If your trip is planned in December 2017 or onwards, please search for current reports before adjusting your plans. 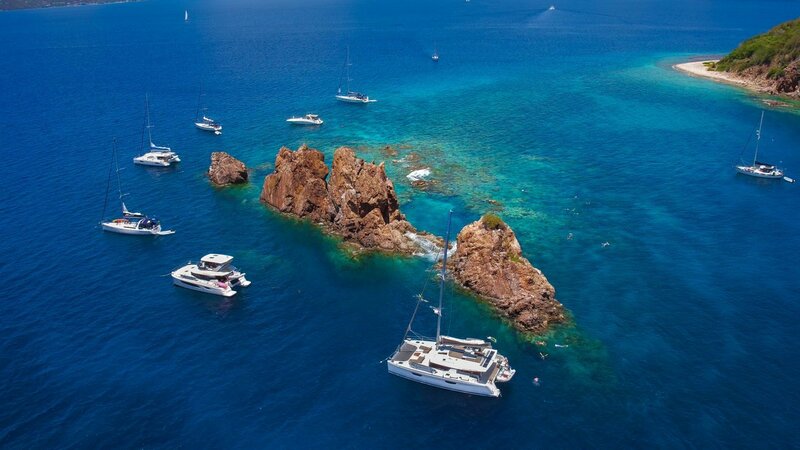 We personally envision many weeks of pleasant cruising in the BVI this season. Although there’s no denying that a massive hurricane season has knocked the islands down, they’re not out. Our interactions with service staff and local residents and have been incredible and you will surely feel a lift in your spirits when BVIslanders recognize you have chosen to spend your holiday with them. Allende is a fully crewed yacht out of the BVIs owned and operated by Kristiann and Graham Gips. Our BVI base is open for business. For more information on booking a BVI charter, email us at infona@dreamyachtcharter.com or give us a call at 855.650.8902.